Over the past 19 years, I have worked with many name brand products, from the cheapist to the most expensive. Based on this experience, I personally recommend the following products for their superior finishes, durability, milling, and solid warranties. 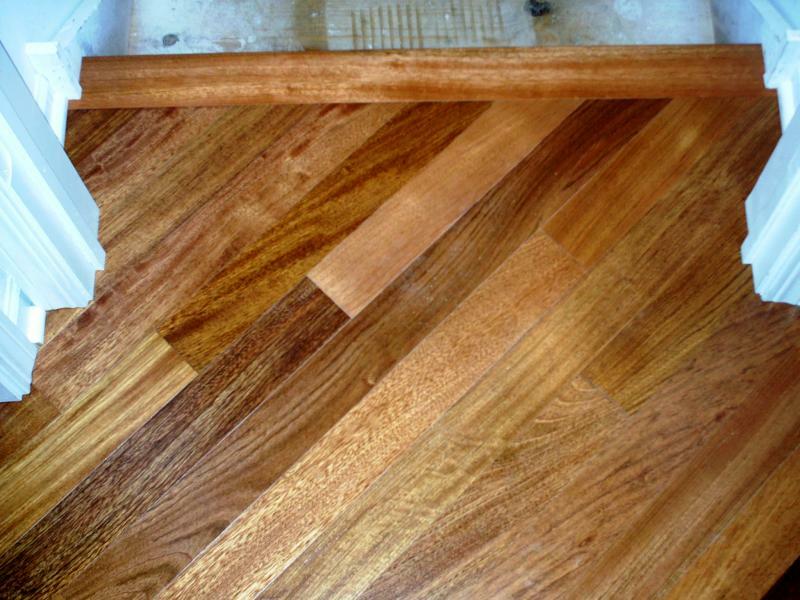 Lw Mountain has a wide selection of pre-finished engineered and solid hardwoods. All of thier flooring comes with a 4 sided micro-bevel, 25 yr warranty and 8 coats of polyurethane. Somerset has a 7 color selection in red and white oak from 2 1/4 to 5 widths. 25 and 15yr warranties are standard with thier products. They also carry engineered and exotic woods with eased edges and square edges. Viking is mostly an exotic line with species like Cumaru, Brazilian Cherry, Tigerwood and Tauri. Viking hardwood also has a mico beveled edge and is now starting to carry oak natural. All of these products come with a matte finish. If you have a concrete foundation I can also supply you with a number of engineered flooring products from any of these companies and more. You have two choices with a concrete floor; to glue down an engineered product or float, which is similiar to laminate flooring. There are three laminate products I prefer to use. Quikstep , Pergo, and Columbia, all of them are glueless laminates with excellent locking systems. Quickstep was the first company with a glueless locking system, they also have a large line of laminates from tiles to random length boards for a realistic hardwood look. Pergo has different colors and patterns than Quickstep,with a wonderful locking system and many realistic wood grains. Pergo also carries a wide variety in ceramic tile patterns, and as a Certified Pergo installer, their warranty is top notch. Columbia's product is made by the same mill as Quickstep, so it's glueless locking system is excellent and they have a few different colors to choose from. I would recommend that all laminates should be no less then 8mm thick,some laminates from big box stores are 7mm or less and cause potential problems in installation and overall look. In this picture you can see how we connected the reducer to the factory edge of the flooring and on top of the ceramic for a clean look. 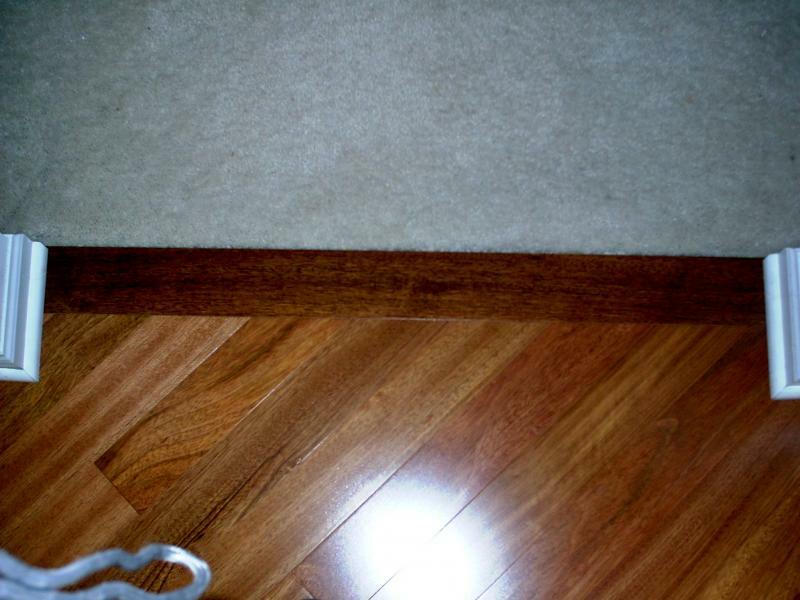 In these two pictures you can see the attention to detail when dealing with stairnosing or carpeting. 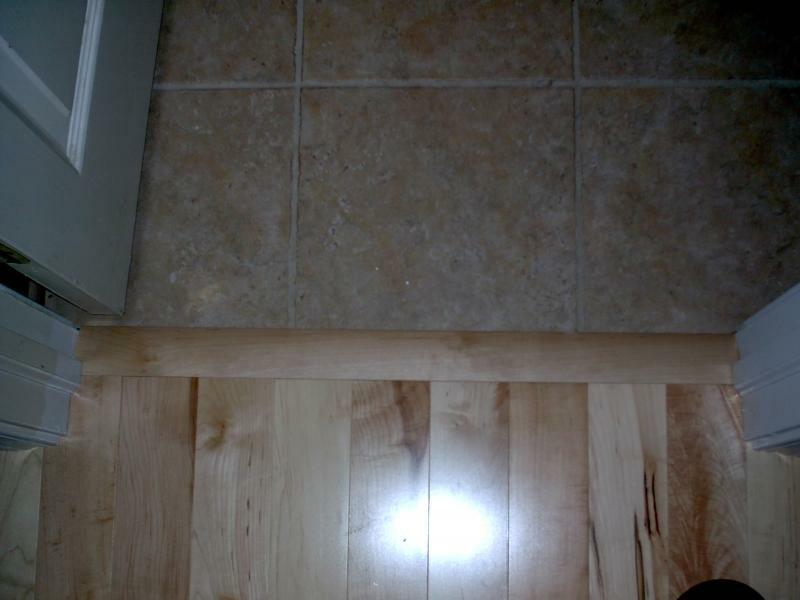 The flooring in these pictures is Viking's Brazilian Cherry, notice that the seams are a micro bevel and that the product fits tight. In the first picture you can see that we undercut all door jams for an overall better look. In the second picture we turned a board so we can use the factory edge to clean the carpet up to.